Classic trestle design with original 22mm competition top. Hugely strong and durable. Green. Blue. 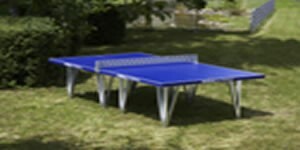 Outdoor table, surface made of fibreglass reinforced polyester. Very even surface. Absolutely weatherproof – proven against heat and cold. Ideal for public areas, school play grounds, and camping sites. Weight 128kg. Blue. 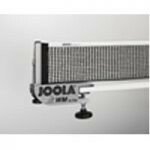 For the first time ever – a Joola Table with a 25mm playing surface. A 100% even bounce of the ball on any part of the playing area and no sliding of the ball. Available in blue or green, and in a wheelchair version. It is also weatherproof. Outdoor table. 22mm sandwich aluminium plate. Comes assembled – ready to play. 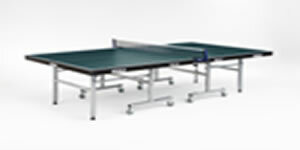 Absolutely weatherproof table with excellent playing features for the ambitious leisure player. 22mm Aluminium plate. Four wheels on each half. Absolutely weatherproof. Light storage. Excellent playing features. 22mm competition playing surface with specially processed polyester coating. Excellent and even ball bounce. Stable metal undercarriage encased in a sturdy plastic surround. top – extremely fast. 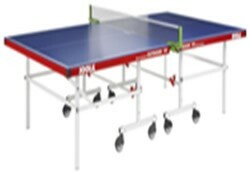 Automatic stand-combi system (wheels can be lifted when playing, locking the table in place, leaving it standing on 8 legs). 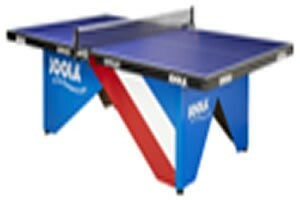 ITTF approved. 22mm – fast playing surface. 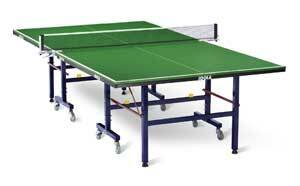 Automatic system A best selling table. 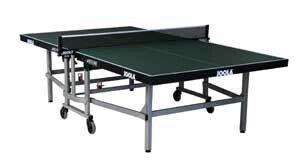 ITTF approved. 22mm playing surface. 4 wheels on each side. 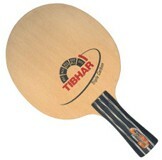 Ideal for Clubs with heavy usage. 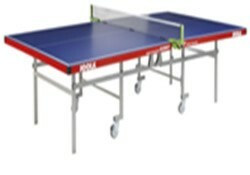 Outdoor table, absolutely weatherproof, on roller undercarriage. 22mm aluminium playing surface.